Heather Feinberg is a counselor, author, and founder of Mindful Kids, a nonprofit organization in Austin whose purpose is to serve children, teens, and the adults who care for them by exploring, practicing, and learning about meditation and energy management tools in inspiring and transformational ways. In her guest contribution today, she brings her perspectives as both a parent and a mindfulness professional to the question of what makes a “really good” education. To learn more about Heather’s work, visit her website or send her an email. A few weeks ago while my daughter and I were shopping, we met another mom with her daughter. As happens frequently with littles, we stopped to chat and play amidst the racks. As the mom and I watched the girls navigate each other, we did our own exploring. She asked me if my daughter (who was clearly older than hers) went to preschool, and I said she did a few days a week. I returned the question, and she told me her plans for her daughter along with some other family details. It turns out she came here with her husband and young child and left their friends and families behind in India. She was eager to have an open mind to speak to, and I quickly became her consult on preschools in Austin. I heard her, acknowledged it, and responded, “Yes! I think most, if not all, parents would say that they want their children to get a really good education.” The thing is, I continued, what each person means by that is probably very different. For example, I continued, I would imagine that your idea of a really good education is probably distinctly different from mine. To me, a really good education is about having an environment that is safe in all ways—physically, emotionally, psychically. Where the teachers are the guides, not the know-it-alls, the ones holding the space, grounded in a set of shared intentions for an experience, not a specific outcome. A place where it is safe for each child and each person to be exactly who they are, and are honored for their place and presence in the community. A place where each child is treated with kindness, patience, and appreciation and is truly seen. In order for this to happen, I understand that it will take teachers, mentors, leaders, and guides who are aware, conscious, and present. A really good education means a place where the children’s senses (all six of them) are ignited. Not at the same time, of course, and not to a point of overstimulation, but in an organic balance of sensory exploration. School is a place where who my child is, what she is passionate about, what makes her come alive, should be explored every day and in many ways. Cooking and eating, singing and dancing, creating meaningful movement, art of every sort, a lot of appropriate touch, and an honoring of each child’s unique knowing (intuition) and fantasy creations are integral and imperative. A really good education fosters autonomy and independence in every child at their unique comfort and developmental level. I visited a private alternative school in Florida earlier in the year where they call any exams given to the students “celebrations” because they see them as an opportunity for the students to celebrate what they have learned. They teach the children how to prepare their brains and their bodies for the celebrations, knowing that they can be a heightened experience. They begin in preschool teaching about the brain, how to notice what part of their brains they are in, and then exploring meditation and mindfulness techniques with the students to help bring awareness and centering. It was powerful to see that in practice. That is just one example of what I mean when I say autonomy and independence. A really good education means our children will learn skills that will equip them in being in the world in a meaningful and powerful way. I want to see our children develop an understanding of currency early on and learn how to create a relationship to it that will serve them their whole lives. I want our children to understand that while we are each unique learners, we are a part of one world community, and while we need to foster self-reliance, we must also accept and invite the support of everything and everyone around us. I want our children to learn to advocate for who they are and for what they believe with their strong, capable voices. Within a really good educational system, children come to learn about what they love and even more than that, develop a love of self. Shouldn’t part of a formal education be about learning to have a relationship with yourself? What I know is that having a relationship with anyone else depends first on how I learn to treat, love, and respect myself. So we do a disservice to our children when we put so much emphasis on their learning how to navigate relationships outside of themselves without at the very least acknowledging and appreciating the connection to the most important relationship we will ever have, the one with ourselves. Yes, learning compassion and empathy is integral, but that love must also include ourselves. What would our world look like if this were emphasized not just in our homes but also in our schools? A learning of what each child loves, a learning of what it means to love, a learning of how to love, both self and others, and lots and lots of space to practice over and over again—that is education at its highest. I am a full believer that if there is something valuable to learn, about 99 percent of the time nature can teach it to us. 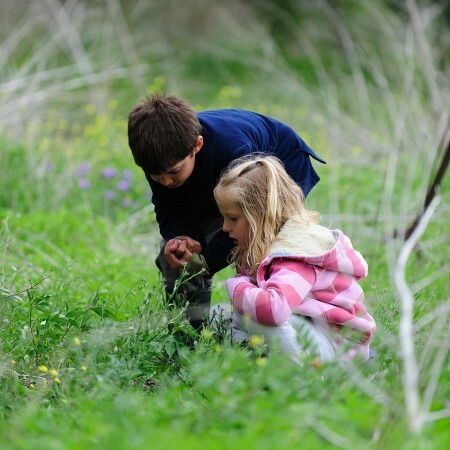 It is therefore vital for our children to spend time outside and in nature. Outdoor classrooms, plenty of time in the sun, rain, dirt, and mud, exploring, creating, absorbing, and just being. Learning how to plant seeds and watch them grow. Learning how plants can heal. Learning how to care for, connect to, and treat animals. Learning how to protect our planet. These are just a few examples of all the natural world has to offer, teach, and share with us. How we learn something is more important than what we are learning. It is the difference between absorption of knowledge and regurgitation of facts or figures. A really good education means that the way my child is taught to read, to do math, and to write is evolved, is itself a transformative experience. The environment itself speaks to the learning potential. I don’t want my child to learn in the ways I learned, not because it wasn't effective for me but because we have a whole new set of tools to use. A really good education means current, innovative programs, models, and systems that are being created in present time. It also means that learning is inspired by intrinsic interest, passion, and joy and not based on external rewards, test scores, or societal norms and expectations. We are born wired to learn. When we set up an environment for children where learning becomes something to do (with incentives, competitiveness, and pressure) instead of something to be (with expansiveness, willingness, and curiosity), it changes the spirit in which we come to know ourselves and our world. Like most things on this list, teaching internal dialogue should be a shared responsibility at home and at school. However, in an era when many children begin at a young age to spend a great deal of their time away from their primary caregivers, this topic becomes even more imperative for the school environment. Children model their behavior first and foremost on what they see, hear, and feel around them. This includes how they begin to formulate their thoughts and turn them into what they believe. I see this as one of the biggest tasks of an education, both from school and home: to help our children learn to have awareness about how their thoughts shape what they know, how they feel, and how they see the world. Put more simply, we need to devote a significant amount of time in our formal and informal educational centers to fostering the internal dialogue of our children. If a school can do so in an intentional way, that is the first step. The next step is how. What tools are they giving children to help them connect to their own minds, and how, when, and where is there space to practice using them throughout the day? How will our children understand their brains and their bodies, their emotional states, their feelings, their internal pulls, and their desires in neutral and non-threatening ways? How will we explore tools that will guide them in the development of managing all those interesting places and spaces? And how will we teach them to be disciplined in their practice? The word discipline comes from the word disciple. We must guide our children to be disciplined in how they talk to themselves, how they care for themselves, and how they treat themselves so that they will come to trust and rely on their inner guidance and strength. Therefore, schools who are visibly and intentionally enriching their curriculum around mindful practice—be it presence, yoga, breathing, meditation, visualization, journaling, all of the above, or something different—are the ones who are truly serving the whole child. That is a really good education. In order for all the above to occur, there must be a shared vision and philosophy for the school community. What is the true foundation of the learning, and what are the intentions of the school? Usually this is created by the founder of the school, but it must be fully accepted, acknowledged, and acted upon by all those who share the space. The children will understand, at their appropriate level of development, how this affects what, how, and why they learn as they do. In a really good school, parents are aligned with the vision and fully support the movement of the community. The adults who work within the school truly believe in the work they do. They choose with each lesson, even each glance, how to create the space and ground the learning. Learning is about absorbing what happens around you, imprinting the energy of all things, so what is being spoken and what is unsaid are equally meaningful. Yes, I fully get how large an undertaking this is. Even as I write this I wonder to myself: how much can we as parents ask for in this capacity? Deep inside I know: we must ask for all that we can imagine. These are our children and the future of our world. After I finished, the mom asked me for my phone number so we could get together again and talk more. I guess whatever I said meant something to her, and I’m hoping maybe it means something to you, too. It surely helped me to get clear on what I want for my daughter and the kinds of environments where I believe she will thrive. I hope more of us spend time thinking about what would be ideal for our children’s education instead of accepting what is made available to us, with blinders on to what may be missing. Your children’s education will have a profound impact on the parts of them that are nurtured, nourished, and fostered and the parts of them that are stifled, challenged, weakened, or cut off. We as parents are active participants in their learning on all levels. What we choose here matters. And as we choose, we effectively change the system of education around us. It exists to serve our children and our families. Sometimes we forget that. Sometimes it's hard to remember. So tell me, what does a really good education mean to you? Michael Carberry is the founder and director of the Whole Life Learning Center in Austin and a cofounder of the Education Transformation Alliance. He is also a writer, speaker, and educational consultant. Michael is currently completing an M.A. in Holistic Education from the SelfDesign Graduate Institute. Here Michael sums up his views on the current state of education and what truly meaningful reform looks like. At the end of his guest post, you can watch a lovely new video about his revolutionary (and expanding) school. It seems like common sense today that a highly standardized education system will only hinder the creativity of both teachers and students, ultimately damaging their ability to teach and truly learn. Students are often lost and disenchanted within this vast, competitive system. I propose that the highest aim of education ought to be supporting every student in discovering and cultivating his or her unique gifts, while promoting a lifelong love of learning. Rather than stressing and obsessing over grades and test performance, we educators and leaders in the alt ed movement shift the focus to guiding and mentoring youth toward living more fulfilled, empowered, and joyous lives while promoting health and wellness, ecological awareness, and social justice. Author Ron Miller describes education as “the primary vehicle for cultural transformation.” This is why it is so important to take a hard look at our traditional education system while researching the myriad alternatives that are sprouting up. When choosing a school for your child, or deciding on an educational philosophy that you are aligned with, you have to ask the questions: What is the purpose of education? What do I want for myself and my child? And what kind of future do I want to contribute to? 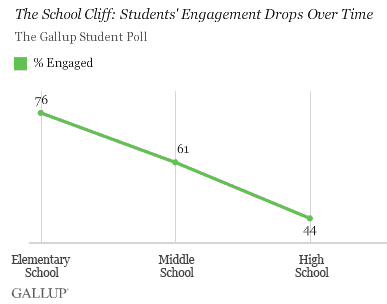 A 2012 Gallup poll demonstrated that the longer students stay in school, the less engaged they become with their own education. The Gallup Student Poll surveyed nearly 500,000 students in grades 5 through 12 from more than 1,700 public schools in 37 states. 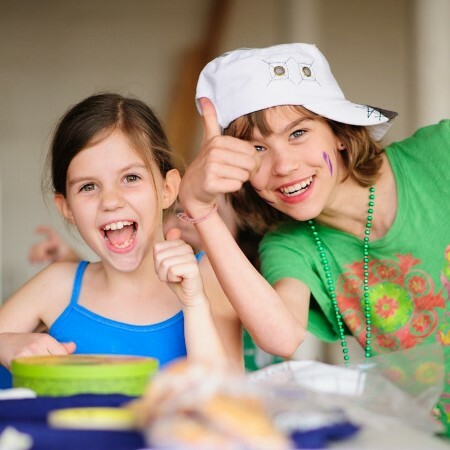 It found that about 80 percent of elementary students who participated in the poll were engaged with their education, measured in terms of “involvement in and enthusiasm for school.” By middle school it fell to about 60 percent, and by high school, only 40 percent of students would be considered engaged. It’s no secret: public schools (and traditional private schools too) are focusing on the numbers and forgetting about the students. The most-watched TED Talk ever is “How Schools Kill Creativity” by Sir Ken Robinson. He makes the case that over the past hundred years our education system has basically emulated the industrial, assembly line model. What we need to return to, then, is a more organic model that understands human unfolding and learning as a natural process that requires diverse environments, specialized attention, and unique inputs in order to nourish optimal growth and well-being. John Taylor Gatto is another outspoken advocate of education revolution. Gatto was named New York City Teacher of the Year in 1989, 1990, and 1991, and New York State Teacher of the Year in 1991. He shocked administrators upon his acceptance of this award by lambasting the public school system in a speech that he later expanded into his book, Dumbing Us Down: The Hidden Curriculum of Compulsory Schooling. Gatto asserts that schools confuse students by presenting an incoherent array of information that the child needs to memorize in order to compete in school. He explains that rather than teaching kids to be independent, creative, confident individuals, schools are teaching (through built-in contexts) emotional and intellectual dependence and indifference. Despite these clear arguments for radical reform in our public education system, pervasive and corrosive programs like No Child Left Behind continue to stifle school districts throughout the country by attaching funding to test performance. The good news is that there is a growing movement of families and educators turning to a rapidly expanding array of alternatives. The increasing drop-out rates and the steep rise in the number of medicated students are just a couple of examples of the fractured system they are leaving behind. In the past, alternatives were fewer and farther between. Awareness around these alternatives was quite limited; perhaps people had heard through mainstream sources about Montessori or Waldorf education, but they probably had a very limited understanding of what those were or why they might be better choices for their families than the public school system. Today the education revolution is in full swing, and it’s not led by any one model of education to universally replace public schools. It’s a movement comprising homeschoolers, unschoolers, co-ops, small independent schools, charter schools, families, and educators choosing options that they’re aligned with—options that see their children and students as more than cogs in a machine being prepared for the workforce, options that recognize that everyone learns differently and honor and support each child’s unique strengths and weaknesses, that recognize the importance of social-emotional learning along with academic study, options that facilitate a connection to nature and promote ecological awareness, social justice, and global citizenship. An invaluable resource in this movement is the Alternative Education Resource Organization (AERO), which hosts an annual conference and acts as an international hub for all things alt ed. In Canada, a great example of government-funded measures to support homeschooling efforts can be seen in the organization SelfDesign, which supports parents financially and with a “Learning Consultant” who helps them create and follow through on an individualized learning plan for their child. One of the cities at the forefront of this education revolution in the United States is Austin, Texas. Yes, that’s right, the home of the President who brought No Child Left Behind to the nation is also one of the most supportive states when it comes to homeschooling. Austin also happens to be a progressive oasis in a conservative state, so it has drawn a multitude of educational options for the many families moving to Austin every day. Beyond the typical alternative options of the Montessori and Waldorf schools, dozens of small, independent schools have sprouted up, each with its own unique learner-centered approach. In 2012 educators representing a handful of these schools came together to create the Education Transformation Alliance (ETA). The ETA, a growing 501c3 nonprofit organization, now shares resources and organizes school fairs and other events to reach more families and let them know about all the great options out there. Alt Ed Austin, the family consulting service and online resource center that publishes this blog, works closely with the ETA and serves as a one-stop shop for parents interested in comparing the many educational options around Austin. Hopefully, more and more communities will catch on and follow this model of synergistic collaboration. Ultimately, the education revolution is not about fixing the current system or finding/creating another system to replace it. It is about supporting the creation of a diverse range of options for families to choose from, while making those options accessible for families, whatever their economic circumstances may be. Every child is unique, every family is different; so why should we continue to pump billions of dollars into a homogenized, one-size-fits-all education for our future generations? It is time we recognize that in order to transform our world to a more just, sustainable, and peaceful place, we need to start by transforming education. We’re doing just that at the Whole Life Learning Center, and you can be a part of it! Please consider supporting our work by contributing to our crowdfunding campaign. Watch the new video below to learn more about our unique programs, our expansion project, and how you can help. Earlier this summer I had the privilege of hearing Ron Miller’s keynote address at the annual AERO conference. Ron is a respected scholar and prolific author on holistic education. His sweeping history, placing alternative education within the context of the great social movements of the past 50 years, made for an unexpectedly sobering session at a largely upbeat conference. Yet it was exactly what many of us needed to hear. Ron’s eloquent talk was refreshingly honest, and it resonated with my own concerns. I am deeply grateful to Ron for granting Alt Ed Austin permission to publish his (slightly edited) prepared remarks here in full. The title of my talk suggests that this year is a historical milestone for the educational alternatives movement; it is, and I’ll get around to that. But I also want to look a little deeper, to consider the history of the past 50 years as a way of understanding the situation that educators, and our entire culture, are facing today. I want to draw some lessons from my own career, which took place during 30 of these past 50 years. I’m going to make two basic points. One is that alternative educational ideas and practices will not be adopted on a wide scale until our culture as a whole changes significantly. Nothing new there; I’ve said this in many of my talks and writings. But my other point is new: After all that I have seen and learned during the three decades I worked in this field, I no longer hold out much hope that our culture is going to change in positive meaningful ways; I am more inclined now to think that it is going to continue on its insane and destructive course until it collapses from its own excesses. At least, though, this collapse will provide the opening for building a new culture, the seeds of which the educational alternatives movement has been diligently planting all these years. Why did the chicken cross the schoolyard? One of my clients, new to Austin, recently asked me, “What’s up with chickens on campus? 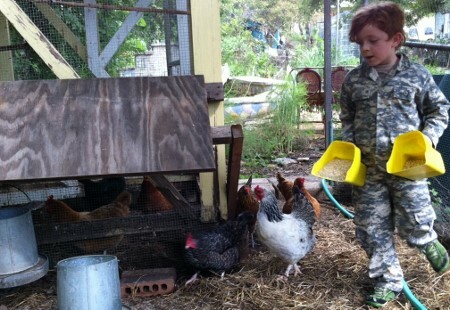 Seems like all the cool schools around here have them.” We Austinites love our backyard chickens, and I am no exception, but her question got me thinking. 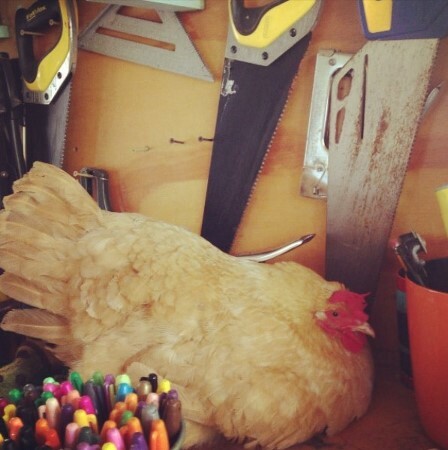 Why do so many alternative schools, each with a different educational approach, make hens and other domestic animals important parts of their curricula and learning environments? I asked educators and students in the local alt ed community. Their answers—some detailed and complex, others beautifully simple—were full of surprises and insights. Here’s what they shared, in words and pictures. Animals are an important part of our community at the schoolhouse. They help us meet our commitment to real sustainability, and they are wonderful companions too! We keep chickens at the neighborhood garden on our block. Every day the kids have jobs to contribute to the work of the schoolhouse. Each week they take a turn on Kitchen Patrol or Chicken Patrol. The Chicken Patrol feeds, waters, fills the nesting boxes with straw, collects eggs, and enjoys the company of our eight hens. 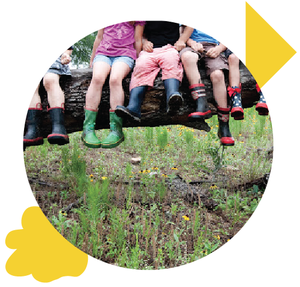 We find it a wonderful way to build connection, feed kids’ curiosity about living things, and teach responsibility and practical skills as well. It is also a visceral encounter with “closing the loop”: we use our chicken poop to fertilize our garden beds via a “chicken tractor”; the feathered ladies scratch and turn up the ground, eating bugs and depositing free fertilizer in the garden! 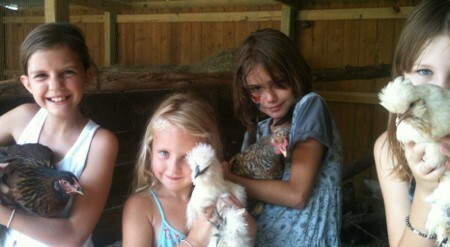 The kids just love playing with the birds, and are so proud to take home eggs each week. 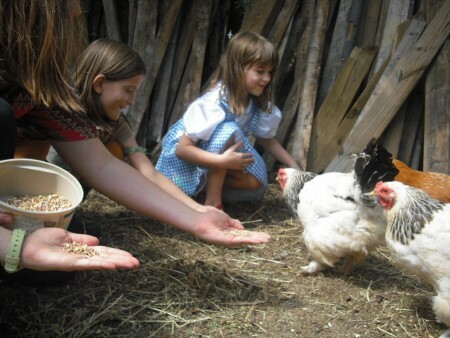 We have a Coop Co-op where participating parents bring in a bag of feed in exchange for a turn on the egg rotation. Fresh eggs can’t be beat! And the kids get the pleasure of sharing the bounty with their families at home. We also have two cats at the schoolhouse: Super Cat, and the more elusive Guthrie. Everyone works to build the trust of the cats, learns how to pet them gently, and is always on the lookout for a Guthrie spotting. (She is the more skittish and of course becomes the prodigal cat when she sneaks up on the porch during the quiet of Class Lesson time!) The kitties often provide a cozy comfort to someone who needs a little love. The Austin EcoSchool community was recently joined by a cheerful flock of seven fowl: six hens and one rooster who has very feathery feet! Our flock was donated by a parent who has been raising chickens and goats in the city for some time. In our Morning Circle last week we talked about chickens, what we know and don’t know about taking care of them. Many of the kids have had some experience and were generous with their knowledge—thank goodness, since I know so very little about the subject! The kids are, of course, all agog at the new additions and spend time with them every day. We’ve been collecting eggs and using them in various cooking projects. There is talk of selling eggs a little later on. We’re also planning to add some chicks to the flock, and eventually we’ll even have pygmy goats! 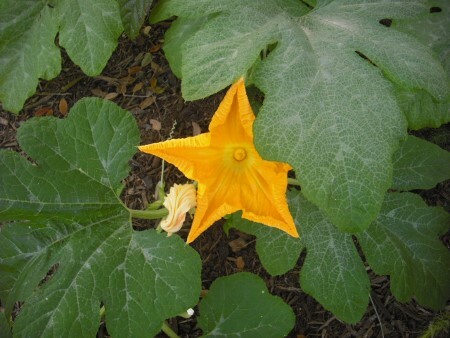 On the subject of urban school farms, our squash plants are going bonkers; there are squash blossoms everywhere! The baby fig tree has wee, cute baby figs on it, and the asparagus plant is pushing up more asparagus shoots. It’s amazing what some rain will do! We’re so excited to be expanding our school farm and edible campus, and I invite everyone to come by and check it out. Our animals are a great asset to the Tinkering School. They are often the first thing that kids connect with when arriving; they help in adjusting to the new environment. They’re a comfort and provide a lot of comic relief and entertainment! 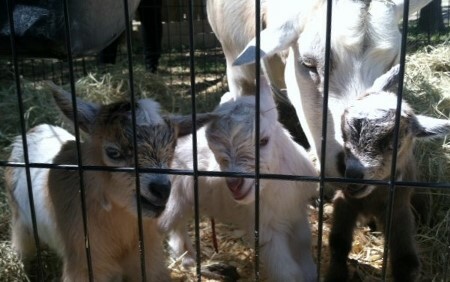 We have chickens, a donkey, two mama goats, and three baby goats at Inside Outside School, with more babies due any day. 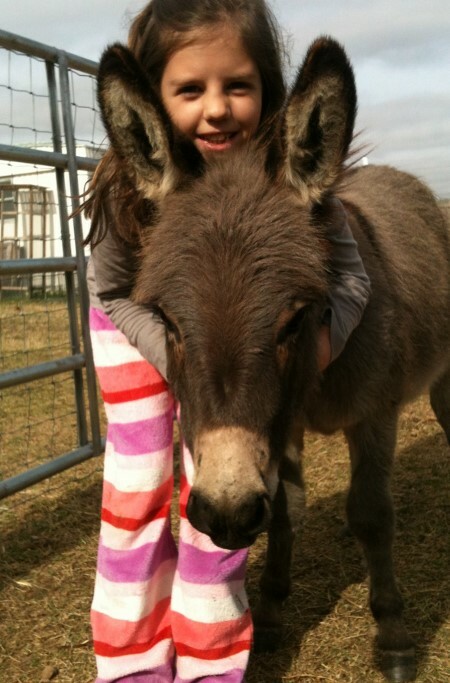 The students feed the animals, collect eggs, hang out in the barnyard, and love on our animal friends. Soon we will all be learning how to milk a goat and how to make cheese and soap. The students have integrated study projects to learn more about animal husbandry and also grow foods in the garden for the animals. Three of our own hens’ eggs hatched last spring, and the students got to watch them grow and change daily. In a world that sometimes seems short on compassion, caring for animals is one incredible way to grow children with big hearts! Animals are an important and personal way to experience the life cycle and to accept and marvel at how amazing it is. They love us no matter what, and they teach us to love and care for something other than just ourselves. The kids absolutely love them! 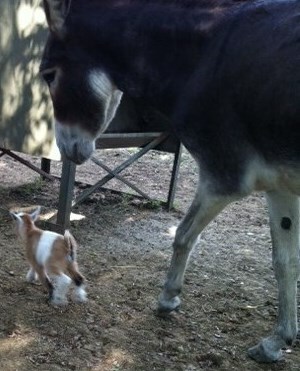 At Whole Life Learning Center we have 20 chickens, a goat named Eleanor, and a mini-donkey named Gertrude. The kids help with their daily care, collecting eggs and tossing chicken scratch, putting out hay and water, and, most importantly, giving them love and attention. They learn about meeting those basic needs as well as some of the more involved aspects of animal husbandry, like training a stubborn donkey to walk on a lead! The kids are so sensitive to the animals’ needs; it’s beautiful to see their senses of empathy and responsibility develop in relation to our feathered and four-legged friends. And it goes both ways: when a child needs some quiet time or wants to practice reading, she can go sit with Gertrude and Eleanor and chat or read with them—good friends always listen. Oh, and finally, they get to see how the animals fit into the whole ecosystem. The chickens give us tasty eggs, the donkey protects the chickens from predators (and protects the gardens from vegetarian predators too), and Gertrude and Ellie serve as our lawn service, complete with fertilizer for the gardens! A parent in one of my recent consultation sessions asked, “How do I figure out my kid’s learning style when she’s just a toddler?” My answer: You don’t. At this age, you wait, you watch, you experiment. Above all, you pay attention to her emotions in learning situations. What do emotions have to do with it? Well, while the research is inconclusive regarding the outcomes of applying learning styles theory to classroom practices, and there is disagreement among education experts about how best to determine and label these styles, you can be sure of one thing: learning style preferences matter—because happy, relaxed learning is the best learning. You know this intuitively. Let’s say you need to learn a new language for your job. Put yourself in a stressful, uncomfortable situation, and your mind goes blank. But get in your groove, whatever that groove may be—listening to language lessons with your favorite music in the background, shooting hoops while practicing with a native speaker, or making a gorgeous set of flashcards with your best art supplies—and you soak up the lessons like a sponge. Austin’s alternative educators understand this powerful phenomenon. Whether or not they subscribe to Neil Fleming’s well-known auditory/visual/kinesthetic model or Howard Gardner’s broader and more elegant formulation in Frames of Mind: The Theory of Multiple Intelligences, or any other particular theory, they’ve built their successful schools on a profound understanding of the simple concept that one size does not—and never will—fit all. That’s why they create systems that honor each student’s individual mix of needs and learning style preferences, allow room for flexibility, and cultivate joy. I’m likely to post more about learning preferences here in the future. For now, I’ll leave you with this lighthearted infographic that the good people at OnlineEducation.net offered to share with Alt Ed Austin’s readers. Take this fun little quiz, and then leave us a comment: What’s your most joyful learning style? Today is the first anniversary of Alt Ed Austin’s official launch, and with a memorable date like 12/12/12, it’s an auspicious start to another promising year of support for authentic education in all its forms. It’s also a good time to pause and reflect on what this growing community (both online and off-) has accomplished over the course of the past year, acknowledge our partners who’ve made it all possible, and look ahead to what’s in the works for our second year. When I created this website and blog last fall, I had modest hopes that it would help connect the handful of small independent schools I happened to know about with local parents who were searching for different kinds of learning communities for their kids who, for a variety of reasons, were not thriving in public, charter, or traditional private schools. Since then, I’ve discovered that there are many more of these unusual schools and innovative educators in the Austin area—and many more parents looking for them—than I’d imagined. When it launched, the Alternative School Directory comprised eight programs serving K–12 students; it currently lists twenty-one. The Map of Alternative Schools now stretches from Leander and Round Rock in the north to Oak Hill and Dripping Springs in the south. Likewise, Alt Ed Austin’s readership has steadily increased, with more than ten thousand unique visitors and a growing and active Facebook community. Likewise, the Calendar has become a busy place, with open houses, information sessions, and workshops posted every month. Almost immediately upon launch, I began receiving requests to add a directory of preschools that could be described as “alternative” in approach. That page has proven to be one of the most visited on the site. Soon I began hearing from both educators and parents who were looking for a way to get the word out about camps, after-school programs, and other, less easily classified educational programs; in response, I created the More Alt Ed Programs list, which is our most frequently updated page. Watch for the return of our popular directories of off-the-beaten-path summer camps in early 2013. The most exciting and enjoyable aspect of managing Alt Ed Austin has been working with and providing a forum for the many brilliant educators who’ve contributed guest posts for the blog. They’ve generously shared their experiences, insights, struggles, and triumphs large and small. In twenty-one posts to date, they’ve written about both theory and practice in ways that are relevant and accessible to parents, education professionals, and anyone with an interest in alternative approaches to education. I’d like to thank all of them for not only helping provide a steady supply of excellent content for this blog but also adding their clear voices to the important ongoing community conversations about what education can be. I invite you to add your own voice by commenting on any blog post that interests, troubles, or inspires you. I’m particularly pleased to report that these conversations are not limited to the blogosphere. Over the course of this year, I’ve become aware of and had the privilege of participating in a movement that has great potential for positive social change. Independent educators are coming together, exchanging ideas and best practices, collaborating and supporting one another, joining with esteemed colleagues working within the public school systems, creating ways to make these alternative models of learning accessible to all children, and changing the educational landscape in ways that I believe will ultimately benefit everyone. You can expect to hear a lot more about the Education Transformation Alliance in the coming year. You’ll also hear about more public events like the independent school tours and fairs that Alt Ed Austin sponsored this year. In addition, we’re planning some brand-new ventures, including film screenings, panel discussions, and workshops on topics of concern to parents and educators. Stay tuned for details about the first of these, which will deal with a very timely subject: talking to kids about climate change. What other topics or types of events would you like to see Alt Ed Austin delve into? Please speak your mind! The comments section below is all yours. Creating, maintaining, and promoting Alt Ed Austin truly has been a labor of love, but I haven’t done it alone. Many thanks go to my family, who have been unwaveringly enthusiastic about the project, even when it has meant long hours at the computer or away at meetings. I am also deeply grateful to those who stepped forward recently when I opened the sidebar for sponsorship to help offset the costs and time required to maintain the site: AHB Community School, Austin Creative Art Center, Edible Austin, Joyful Garden, Kairos Learning, Progress School, and Soleil School. Most of all, right from the beginning, it’s been the audience making this thing work. Without all of you reader-collaborators participating, supporting, and spreading the word, Alt Ed Austin could not have become the useful resource and thriving community it is today. Thank you! I look forward to working together in the coming year to support diverse, wonderful ways of learning in Austin and beyond.